THE TALON EDGE: 4 unique models with increasingly angled Jazz style tips for ultimate string response and ideal contact. UNLEASH TONE & TECHNIQUE: The dynamic design sculpts your delivery to unlock new realms of tone and sharpen technique. ROTATE TO FLAT PICK: At any moment, rotate 90° into the flat pick position for that “open” strumming tone and feel. COMFORT BRED IN FUNCTION: Craft molded with a natural thumb contour & raised grips, eliminate pick slipping and repositioning. If you are in the market for cool guitar accessories for the musician in your life, Talon Picks has you covered with our revolutionary no slip guitar picks. 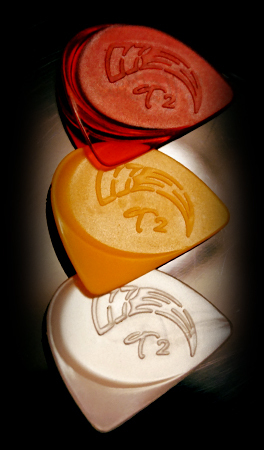 We have taken the next step guitar pick evolution with our unique and angled guitar picks, which afford the player the ability to strike upon the strings, rather than merely across them. Our picks must experienced to be understood completely, so if you are wanting to open up a rich new vein of tone, texture, and dynamic feel.